We usually plan our New Year’s Eve early. We would arrange to join friends for a dinner celebration either at a restaurant or at home. This year, however, with my busy travel schedule to Asia in November and December, hosting our family Christmas celebration and organizing Warren’s 60th birthday party we found ourselves without a plan. Fortunately, a neighbor suggested we join them and their friends for a late night champagne and h’or d’oeuvres gathering. Grateful that we need not have to ring in the new decade by ourselves, I offered to help with the food. The hostess is planning finger food for the party, so I immediately considered making dumplings. They are excellent party food because they can be prepared in advance and kept warm in a steamer until ready to serve. They can also be served on a platter with decorative wooden picks for easy handling. As it turned out the produce section of the Pathmark store across the street is stocked with beautifully fresh bunches of dill this week. They reminded me of a northern Chinese dumplings made with dill and pork filling with a fresh flour dough wrapper. Called dill jiaozi (茴香餃子), they are usually boiled and served with a vinegary and gingery soy sauce. Instead of making the common pork based dumplings I decided to transform the dill jaiozi into Cantonese style steamed dumplings (蒸餃). I use Dungeness crabmeat instead of pork and substituted commercially made egg noodle wrappers for the fresh flour dough. I pre-cooked the dumplings and will bring them to the neighbor’s in the bamboo steamers they were cooked in. While guests are arriving I will keep them warm over very low simmering water. As a last minute addition for a New Year’s Eve party I think these dumplings are going to be a hit. The crabmeat paired with fresh dill will create an unexpected taste sensation, and along with the flying fish roe and dill sprig garnish will be an elegant way to celebrate the New Year! Make half of the recipe for the fish paste from my previous post and set aside in the refrigerator. If you’re using fresh whole crab then make sure to pick the meat carefully to ensure no stray shells are left with the meat. Chopped the fresh dill finely and set aside. 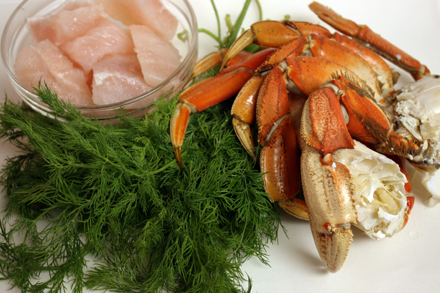 In a medium bowl mix the fish paste, crabmeat and dill together thoroughly. Wrap the dumplings by putting about one tablespoonful of filling in the middle of the wrapper. Moisten the edge with water all the way around. Then fold the wrapper in half. With two fingers of one hand squeeze the top of the wrapper together. While still holding the dumpling with that hand use the other hand to make pleats along the rest of the edge to seal the filling in the dumpling. Brush a thin layer of vegetable oil on the bottom of two 10-inch bamboo steamers and arrange the dumplings evenly. Cover the steamers with damp cloth if you’re not steaming them immediately to prevent the pleated edges from drying out. Steam the dumplings over rolling boiling water for about 15 minutes. You can hold the dumplings warm over low simmering water to keep warm if necessary. 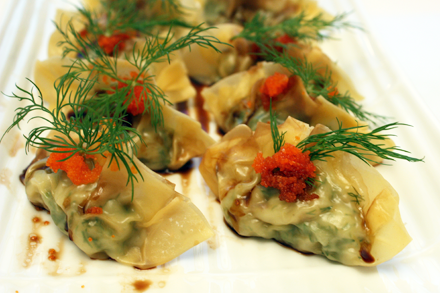 Arrange the dumplings on a platter, sprinkle with dipping sauce, and garnish with flying fish roe and dill sprigs. These dumplings look fabulous. 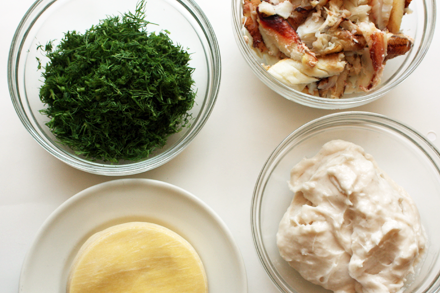 I’ve never had crab and dill together but I’m looking forward to trying this recipe. Happy New Year Christine! The dumplings were a hit last night. Very nice! I love dumplings of all kinds, but we’ve not yet tried to make them at home. Someday soon! Would you recommend shrimp as a sub for Crab meat? I confess, I am totally lazy and don’t want to go through the trouble of de shelling. Bring on more dumpling recipes please!! Do you have any favorite places in NYC (and boroughs)to eat dumplings? Happy New Year. Can’t wait for your Chinese New Year posts. Happy New Year to all! flyinghorses, yes you can substitute shrimp for crabmeat. Do cut up the shrimp a little so you can enclose them comfortably in the wrapper. As for restaurants in NYC I like Nan Xiang Xiao Long Bao Soup Dumpling House on Prince Street in Flushing for Shanghai soup dumplings. Chinatown Brasserie in Noho has good dim sum dumplings, although not Chinatown prices. And for the best pot stickers in NYC go to “Fried Dumplings” at 106 Mosco St near Mott Street in NYC Chinatown. One of our faculty just gave me a bamboo steamer for Christmas – so I could make dumplings! I will bookmark your recipe so I can use yours! Looks yummy! Margaret, I consider this recipe as Cantonese style dumplings and not jiaozi. The wrapper is egg noodle based. I will post more about jiaozi later. The dumplings looked so delicious! I want to make some right now! And, by the way, can I substitute any ind of meat for crab? I hope it will not affect the taste. Thanks. Kian, always enjoy your writing style and recipes. As well, your images make me want to jump in and take a bit! Excellent websites, how great your are sharing your techniques to others on the world. Great good will of you. I am very much appreciate your good will. I have never tried crab in my dumplings before. Knowing you have made them and they worked well, I will not hesitate to give this meat a try! 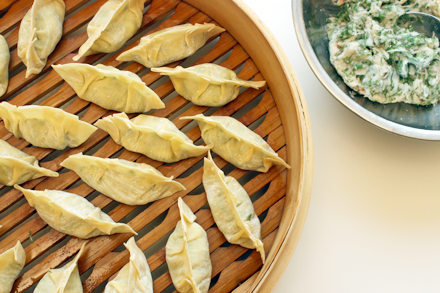 Thanks again for the inspiration – I just love dumplings! Yummy! !